Why should you become an RDA member? Joining RDA as an Individual Member is free, simple and easy. 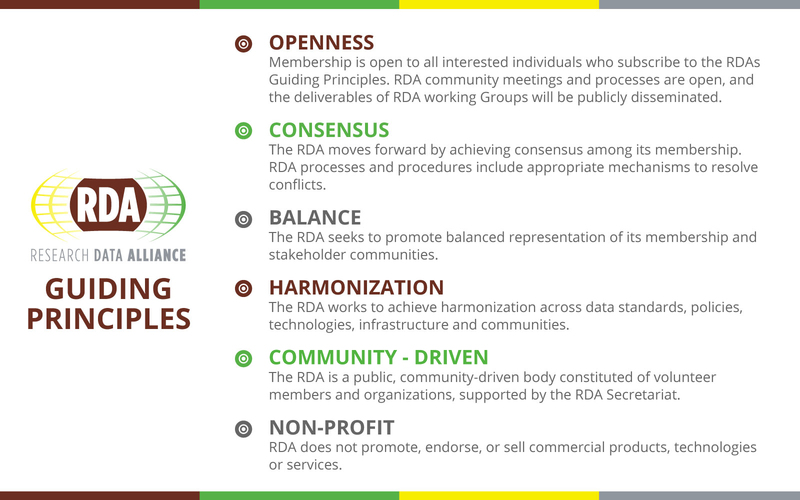 All members are asked to subscribe to the alliance's Guiding Principles. What are benefits of becoming an RDA Member? Since its launch in 2013, RDA’s membership has grown to more than 7,800 individuals from academia, industry, and government, representing over 137 countries in numerous disciplines, including but not limited to library sciences, Earth science, astronomy and meteorology. How Does RDA Help You? However, infrastructure challenges often prevent effective and efficient collaboration among data producers and users. As an RDA member practicing in any of these professions, you have the opportunity to overcome these challenges. Through your participation in an RDA Working or Interest group, you will have the opportunity to engage with those in your field and those in different professions to develop and implement data-sharing infrastructure solutions that could potentially accelerate interactivity and innovation among all disciplines and industries worldwide.